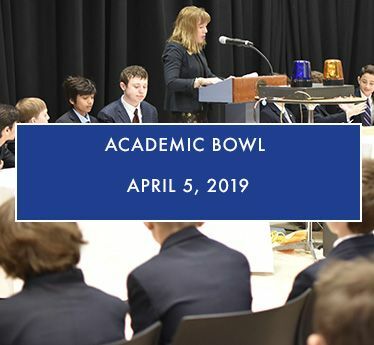 Allen-Stevenson’s 2019 Annual Academic Bowl, held on April 5, incorporated challenging questions and covered a plethora of subjects, including math, history, English, geography, Spanish, music and science. The two teams consisted of top scorers from a quiz taken by Upper Schoolers prior to the Bowl and included: Lincoln Williams ‘19, Vivek Laddha ‘19, Raam Melvani ‘19 and Ellis Resnick '20 on The Allen Team and Jack McGovern '19, Adam Gall '20, Jack Gelder '20, and Gabe Jaffe '20 on The Stevenson Team. The Bowl kicked off as Jaison Spain '97 welcomed each contestant to the front of the Assembly Hall, introducing them to an audience of Middle and Upper School boys, parents, faculty and staff who gathered to watch the teams tackle the questions with confidence and skill. The Stevenson Team and Allen Team alternated turns answering questions posed to them by our hosts for the day: John Zufall, US Science Teacher, and Mary Leonard, Math Team Leader. The audience was captivated as the young scholars solved complex math equations and showcased their knowledge on a wide range of trivia questions such as: Who were the other targets of the Lincoln Assassination? ; What is the role of commentary in an analytical essay? ; What group of living things do not have a living membrane? ; What are the four ways to say "you" in Spanish? ; and What is Harry Potter’s mother’s first given name? After a brief deliberation on scores, the winner was announced… the Allen Team! A huge thank you to the judges, Colin Clark '20 and Omega Zerfu '20; Mary Leonard and John Zufall for organizing this year’s Bowl; Jaison Spain '97 for the sound, music and lights; Randy Schrade '76 for playing piano; the Maintenance Department for the set up; and the many, many teachers who came up with so many wonderfully varied questions.